AgriGro test results have proven conclusively its effectiveness and is changing our approach to plant and soil fertility. For over 30 years, AgriGro has allowed growers to produce healthier crops, better turf and plants while using less chemicals and fertilizers. Agrigro all natural biostimulants really work! 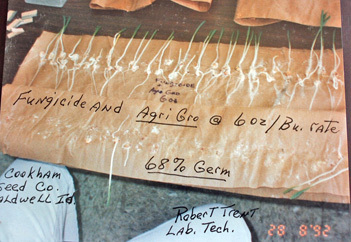 This page contains early samples of Agrigro test results from the 1980's and 1990's. 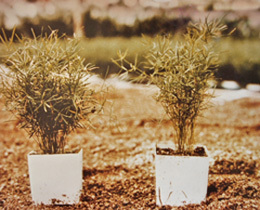 AgriGro Products (AgriGro Marketing, Inc) is the maker of several 100% all-natural plant and soil biostimulants manufactured in different formulations for every growing situation. Developed by a bio-chemist, AgriGro contains a unique blend of micronutrients, enzymes, amino acids, and complex carbohydrates designed to increase plant health, stimulate growth, and increase the soil's biological activity. Scientifically formulated, AgriGro dramatically increases the soil's microbial activity allowing for an increased uptake of soil nutients. Soil microorganisms are shown in lab results to increase by 3200% within the first few days of application improving soil tilth and fertility. The plant's response is amazing with increased root and tissue growth and improved resistance to disease and insects. The result is healthier plants, faster breakdown of organic matter, and the release of nutrients that were previously unavailable. Please take some time to look at the Agrigro field test results and see the future of plant, tree, and turf care. AgriGro's Turf Formula is specifically designed for sports turf, sod farms, lawns, and hayfields. In the upper left photo, superintendent Roy Briggs is speaking with AgriGro founder, Ron Smith, about the product's benefits. 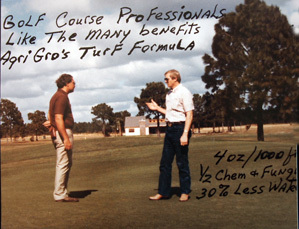 The photo says "Golf course professionals like the many benefits of AgriGro's Turf Formula." The lower corner indicates the Turf Formula was used at 4oz/1000 sq.ft., mixed together with half the normal chemicals and fungicide and used 30% less water. I recently spoke to Roy on the phone (no longer a superintendent, he now builds golf courses in Florida). Roy recalled that he could begin to see results in just two days after applying Turf Formula along with the Super-Cal Liquid Calcium on his greens. He remarked at how great the products worked. 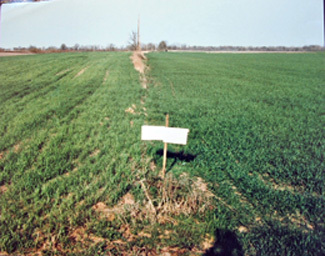 The upper right photo shows a wheat field used for product testing. The left side used a standard fertilizer treatment. 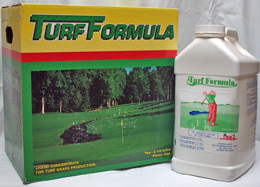 Turf Formula was applied to the right side, plus half the normal fertilizer rate. Notice the right side has already filled in better than the left side using only standard N-P-K fertilizer. The two photos above demonstrate how the Turf Formula promotes root development. The upper left photo shows wheat growing in two separate trays. 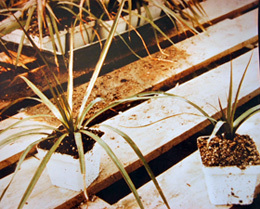 Potting soil was used in both trays. 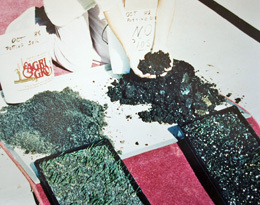 The tray on the left was sprayed with Turf Formula. The tray on the right was not. Notice how the increase of beneficial microbes have already started breaking down the potting soil. 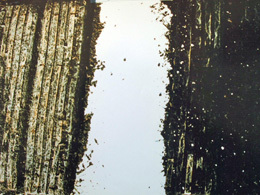 The real evidence is when the trays are turned over and the roots exposed. The upper right photo shows the roots after the two trays were flipped over. The Turf Formula tray already has an abundance of well-developed roots compared to the tray without the biostimulant. Commercial sod farms using Turf Formula have experienced the same result and is solid evidence of how well the product works. 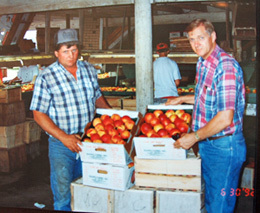 AgriGro founder, Ron Smith, is pictured with Billy Bader, owner of the largest peach orchard in the Midwest. Billy has been using Foliar Blend for over 20 years. Peach size and quality has exceeded his expectations. His trees are healthier making them more resistant to disease and insect pressure and the proof can be seen in his peaches. He uses the product, not just on his orchards, but his field crops as well. Foliar Blend has been a key element in the quality of everything he grows. Mr. Bader's orchard is in Campbell, Missouri. I recently had a telephone interview with Bill Bader and followed up with a visit to his orchard. The interview with Mr. Bader, along with photos of his peach orchard, can be found at the bottom of this page, the navigation bar and right side column on this page. 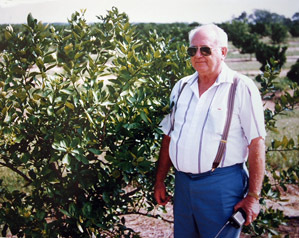 Orchard owner, Jim Hatley, (photo above left) is standing next to an orange tree growing on his farm in Winter Garden, Florida. Jim has seen first hand the advantages his trees have had with Foliar Blend. During a freeze, many surrounding orchards suffered 80 percent loss, while Jim's orchards had only a 20 to 30 percent loss. It was shown that Foliar Blend helped increase the tree's resistance to freeze by two or three degrees. 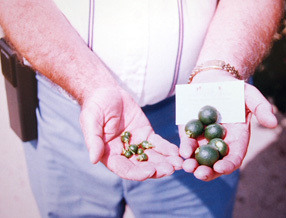 The second photo shows oranges collected from a neighboring farm compared to his oranges collected after the freeze. 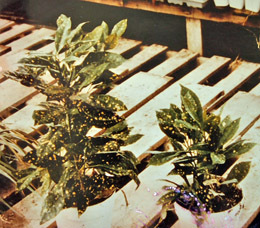 Each of the three photos above show the difference between plants treated with Foliar Blend sitting next to a plant that received standard N-P-K treatments. 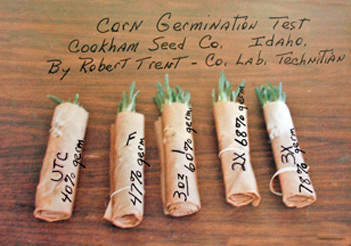 Comparison plants were the same size and age at the beginning of the test. In each case, the difference is clear. 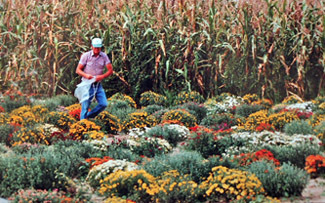 In this picture taken many years ago, Ben Hillis praised the effects of Foliar Blend in his nursery. Ben had commented that he can fit 30% less mums in his truck since using Foliar Blend. The plants are much fuller and the root systems are more developed. All this with an increase in disease resistance, while using less fertiizer. The six photos above display the results of a Corn Seed Germination Test. 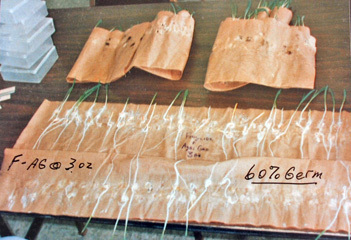 The five tubes had the same amount of seed placed in each one and the percentage of germinated seed were noted. The Agrigro test results may be hard to read, so I will describe each photo below. 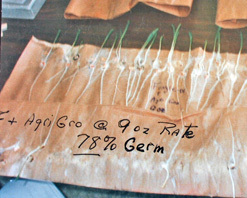 Photo shows the five separate tubes with germination percentages recorded on the side. 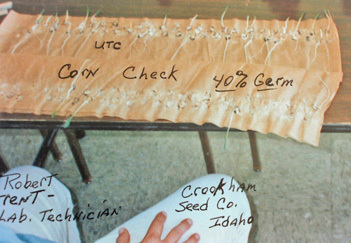 Agrigro test results are unlike anything else. 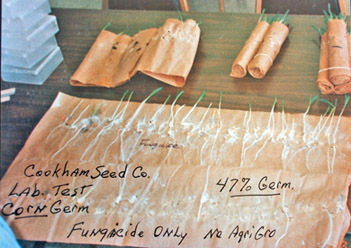 Notice the seed germination rate was improved with the fungicide and even more when combined with AgriGro's biostimulant. It can be a stand alone biostimulant treatment or mixed with fungicides, herbicides, insecticides, and fertilizer. AgriGro products can be easily incorporated into any lawn maintenance program. It can be added to your chemical or liquid organic fertilizer or applied directly to the turf. The synergistic effects will allow everything to work better. Bill Bader owns the largest peach orchard in the Midwest with nearly 1,100 acres of peaches. He has used AgriGro Foliar Blend Biostimulant and Super-Cal on his peaches for over 20 years. See our interview with Bill. We are now selling AgriGro Biostimulants. Check out the pages below to see how you can increase Plant and Soil Fertility while even using less fertilizer..
Scientifically formulated for lawns, sports turf, fields, ground cover, or many other plants. Lab and University tested with results including 35% increase in root growth, improved disease resistance, 3400% increase in microbial activity and much more. The small package good things come in. Bountiful Harvest is a powerful biostimulant packaged in smaller packages and can be used for everything you grow. Foliar Blend is used by landscapers, homes and estates, farms, orchards, nurseries, and growers of all types in 49 countries around the world. Check out all the amazing things it can do. It can be purchased from 5 gallons to an entire tanker truck. A highly effective organic biostimulant for increased root growth, stimulated soil microbes, and increased soil fertility and more. Super-Cal provides in immediate source of calcium plants need for root growth, maximum microbial activity, disease resistance, and maintaining soil pH. Click here to see why calcium is so important and why you need it. Designed to be tank mixed with all our biostimulants or can be used alone. Check out the University and Lab results. Incredible results you have got to see. A look at the science of organic biostimulants with University results for many common products. Mr. Bader owns the largest peach orchard in the MidWest with 1100 acres of peaches - 110,000 trees. Bill has used AgriGro Biostimulants and Super-Cal for over 20 years. See why and how he uses them.